Remember those toys from when we were kids? Most of the specific toys being referred to were designed as cars. To play with them was simple — pull the car back for it to buzz and zip across the floor. I was a little indifferent towards them. The clicking sound was annoying to me — it sounded “crunchy” for some reason, and crunchy reminds me of Velcro, and I don’t like Velcro — and the overall fun factor was short-lived. The car would have to be pulled back again. Hopefully, this time, the damned thing will drive straight and fly off of the ramp that I constructed out of books. Maybe the toy cars were trying to tell me — if not us — something. Perhaps we should be taking steps back before we shoot forward. It’s annoying, taking a step back from a project or hastily seizing the day. But there is a slim chance of fully comprehending whatever that task or decision is. I’m not saying that goal setters or go-getters give themselves a reality check — perhaps I am … — but haste does make waste. And forcing yourself back or off to the side, in similar fashion to the toy, is crunchy and annoying. Backtracking is never fun, but it could be productive. Perhaps if good ol’ Charlie Brown really took a look at the football situation, maybe he would have gotten a better running start to flip himself 360 degrees instead of 90, placing him on his back. It makes sense. In Super Mario Brothers the top of the flag pole could easily be reached with an appropriate running start. In car chases, the vehicle has better trajectory if it speeds up appropriately. If Marty McFly poorly timed the DeLorean’s speed, he would have never time traveled. Last year, I started a few books that I did not finish. They sat in my bags and were rarely picked back up. This year, I picked up two of them and started them over. The books — George Saunders’ The Tenth of December and David Benioff’s When the Nines Roll Over — are now complete. Finally. Two books are under my belt, considering my lifestyle. I’m proud of that. Next up: Less Than Zero by Bret Easton Ellis. The copy I have is only 208 pages. Any haters? Some of you are shaking your head at me, contemplating that you think that short story collections are “not books”. Frankly, I think more people should tap into short stories. The niche of literature, which is less wordy, is a bit more calculated. Sometimes I’ve taken more out of a short story than I have a novel. On a personal note, this acknowledgement allows me to reconsider writing a novel and opting for the stories. The novel, as it still collects dust, is made up of “short stories” as is. Each chapter/story jumps in time, but not drastically — it takes place over a year. So, perhaps the art of teaching oneself to step back is the key to this supposed great start of 2015. Meditation is stepping back. Recognizing and tuning skills is taking a step to the side. The new part-time job is emphasized by the part-time aspect, but it’s full of fun and what I’m aiming to pursue. I’m meeting new people. This is needed. I’ve tried new things: the Polar Bear Plunge being the most recent. Pushing aside the doubt of fulfilling this challenge was a challenge in itself, especially day-of. But I went in, and swam for the most bitter-cold and longest 12 seconds of my life. But let’s digress with a moment about Auburn, New York. I’ve driven through the city numerous times. It’s a historical place when referencing of William Seward among other aspects. It’s in the Finger Lakes Region, a very large “wine country” and agricultural beacon in Upstate New York. Two Fridays ago, I went to a movie at the Auburn Public Theater — The Babadook, which was great. I missed it at Syracuse’s The Palace Theatre. But the new atmosphere of stepping out into a Auburn at night, being in a different city, save the fact it’s less than an hour from Syracuse. Aside the movie patrons, who I tried to strike up conversation with post-movie, while leaving and to no avail, I’m sure the residents are nice. There was a pub across the street that looked appealing, the streets and store fronts have appeal, new people are to be met. Cities of all sizes have their charm, vibes. It’s going to be fun to get accustomed to it. 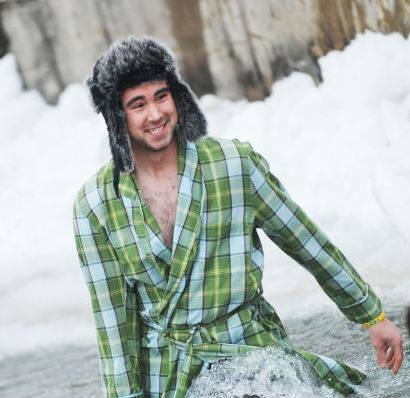 I’m sorry, I did read the entire post but I can’t get over you doing the polar plunge. In your bathrobe! Have you recovered? Love the way you accessorized with the furry hat. Nice job! I have recovered, finally! I’m glad I have your approval with accessorizing. It’s a big compliment from you. I know you’d be impressed if I had pink, sparkly attire. Maybe next year. Off you go down a new track, Christopher Malone. May you and Auburn both be wealthier for the new relationship, my friend. I hope so. I’m growing accustomed to the area. So far, so good. We’ll have to do a weekend lunch soon. Yessir. I would like that. (1) All of your book titles have numbers in them. Is that a happy accident or purposeful? (3) I like itemized lists. (2) High-five. I love how you mentioned graphic novels. (4) From one Cards Against Humanity fan to another. Actually, a group of is played “charades against humanity” two Mondays ago.